Squeezed between the Pacific Ocean and the coastal mountain range that runs through San Mateo County, Pacifica is located about 20 miles south of San Francisco. With an average rainfall of about 30 inches per year and annual temperatures that range from 45 to 78 degrees, this isn’t a place that brings tropical plants to mind—especially in the summer months when this part of the coast is blanketed in thick fog. Daniel and Patricia Yansura moved to Pacifica in 1983 and Daniel, interested in paleobotany and primitive plants, started collecting and propagating tree ferns there shortly afterwards. Growing some ferns in USDA Zone 10A (Sunset Zone 17) poses unique problems. While temperate ferns thrive in the fog, cool temperatures, and high humidity, many tropical and semi-tropical plants languish without heat. Through years of experimentation, Daniel has discovered that many tropical tree ferns can adapt to the cooler climate—provided they are acclimated properly. 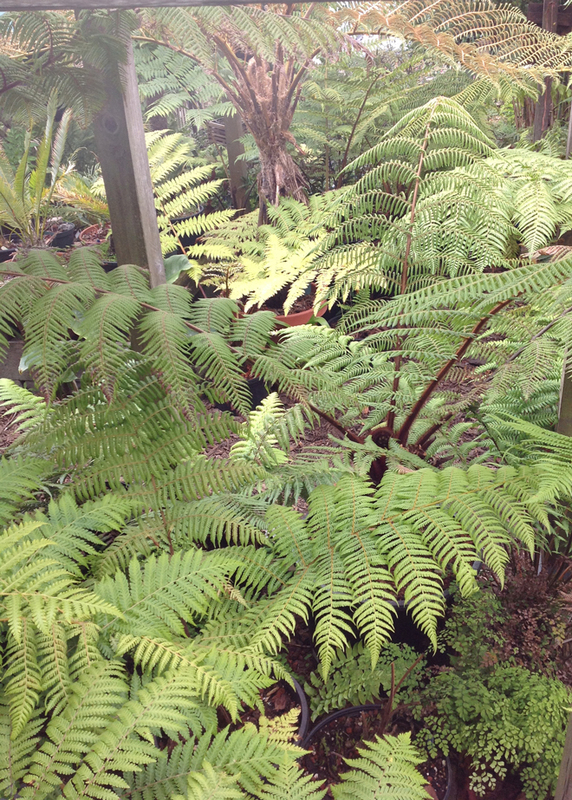 An immediate challenge to cultivating ferns was a lack of shade on his property, so Daniel began by planting two tree fern species that can tolerate sun, Dicksonia antarctica and Cyathea cooperi, to provide shade for other species in his growing collection. Through research, Daniel discovered that while there are more than 600 tree fern species in the world, few of those he was interested in were commercially available. So he began to try propagating ferns from spores. Daniel joined several fern societies to obtain spores and share propagation techniques with other society members. He met fern enthusiasts from around the world and has travelled with some of them to collect spores in places as varied as New Zealand, Costa Rica, Australia, Hawaii, Japan, Singapore, Myanmar, and throughout the Caribbean. Although his initial attempts to grow tree ferns from spores had poor yields, as his techniques improved, so did his results. Daniel now grows about 300 species of ferns and lycophytes (the division that includes clubmosses and spike mosses) in his collection. Spores are very different from seeds. While seeds contain the full set of a plant’s chromosomes, spores contain half of the chromosomes of the parent fern—like eggs and sperm of animals. In fact, fern reproductive cells are called “sperm” rather than “pollen,” offering a clue that fern reproduction is very different from flowering plants. Spore viability varies from weeks to years, with chlorophyll-containing spores having the shortest viability. To successfully propagate ferns, Daniel carefully applies fresh spores to the surface of a sterilized, peat-based substrate using a cotton swab. Once spores are placed on the medium, germination pots are kept in unique, insulated, temperature-controlled propagation boxes that Daniel designed and built out of all sorts of materials, including old aquariums. The boxes are lit by LED lights on a 12-hour light cycle. Heating pads and small fans keep the temperature perfect and circulate air to keep mold and other pathogens at bay. Daniel’s propagation house is unique in another way. All of the power to heat, light, and humidify the propagation boxes comes from photovoltaic panels on the property. Even in the coastal fog, Daniel and Patricia use solar power to run all the electrical devices on their property. Everything from the tiny fans in the propagation boxes to the refrigerator in the kitchen is designed to be as energy efficient as possible. The pots are monitored closely to make sure that the medium maintains the proper moisture content. If all goes well, the spores develop into gametophytes, an intermediate stage of development. Gametophytes look like liverwort, spreading out in a green film over the surface of the substrate. 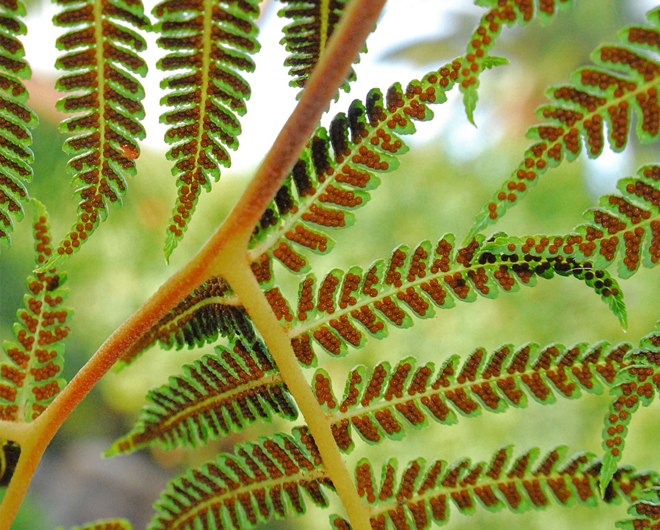 Like spores, the tiny gametophytes only have half the chromosomes of an adult fern. Dry-climate species, such as Cheilanthes, develop quickly, probably because of the demanding habitats where small gametophytes can dessicate quickly. Others mature very slowly, with gametophytes remaining in this state for several months. The mature gametophyte produces gametes—the eggs and sperm—and then a miraculous event occurs. The tiny sperm migrate across the surface of the gametophyte, swimming through a film of water that collects on the surface of the living tissue. Without this water film, the sperm could not migrate to the egg and fertilize it. Once fertilization takes place, the full complement of chromosomes is present and a small fern, called a sporophyte, begins to grow. The sporophyte has the recognizable petioles and leaflets of a typical fern frond. Dozens of sporophytes can grow in a four-inch pot, so Daniel thins them out and repots them individually, which quickly fills a greenhouse with young ferns. While some species grow with little care at this point, many others require exacting conditions, and Daniel has lots of stories to tell about all the things that can—and do—go wrong. Despite setbacks, he has mastered the art of propagating many ferns. His greenhouse is filled with one- to three-year-old plants in four-inch pots. Once their roots are strong enough, they are moved into gallon pots where they continue to grow for another one to two years. Only at this point are they strong enough to move out of the greenhouse and into the garden where they are hardened off. The more promising ferns are planted in the ground and monitored carefully for at least a year to determine if they can thrive throughout the seasons. Some plants cannot take winter cold and have to be brought back into the greenhouse. Some ferns can take the winter chill as long as they are protected from too much moisture, which causes them to rot. Gardeners in the Pacific Northwest and Northern California are accustomed to succulents rotting from a combination of cold and damp, but we don’t usually think of this as a problem for ferns. Other ferns, even some from tropical parts of the world, adapt well to the local climate as long as they are moved outdoors in mild weather and allowed to adapt slowly to the cooler months. When the ferns mature, they produce more spores. Spores form in sori, creating the familiar patterns that we see on the undersides of fern fronds. 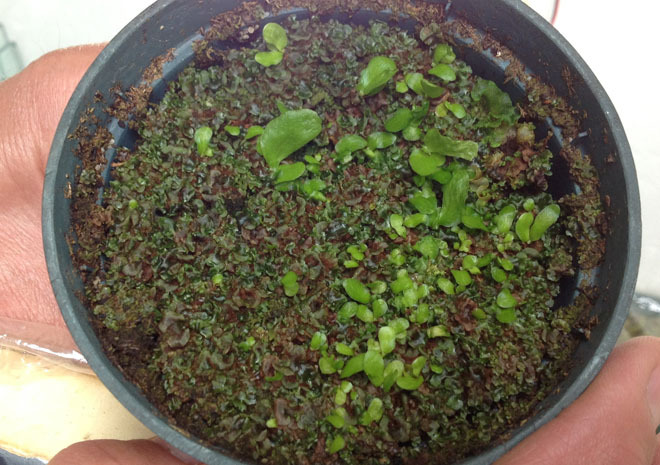 The cycle then repeats, and if conditions are good, another generation of gametophytes will grow in situ. Daniel monitors his garden closely to make sure that gametophytes aren’t forming in a manner that indicates a plant may be invasive. To maintain his garden in the drier months, Daniel has tanks that store 1700 gallons of rainwater. His garden uses about 100 gallons of city water and about 40 gallons of rainwater every week. He also uses gray water from the shower and laundry to irrigate parts of the garden. Reclaiming water, spreading a thick mulch, and strategically placing rocks pays off—the garden thrived during the recent five-year drought and Daniel’s household water usage was average for the Bay Area. All of his time and hard work has paid off. Daniel propagates many species of rare tree ferns and generously gives away plants to other fern enthusiasts. He is a volunteer fern propagator for the San Francisco Botanical Garden at Strybing Arboretum. With other volunteers and the staff, he has added more than 40 species of plants to the Ancient Plant Garden, renewing his interest in paleobotany. 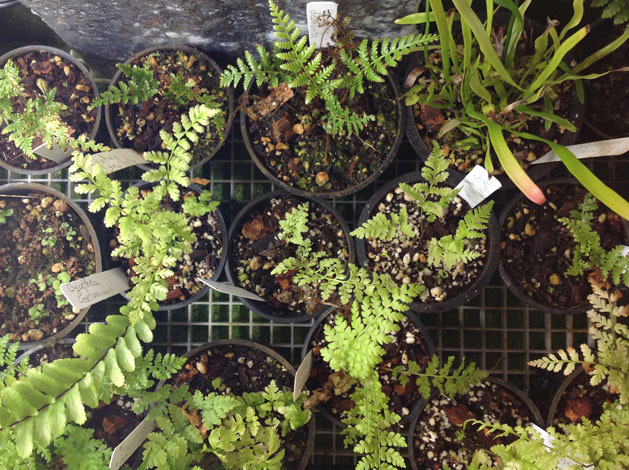 Daniel regularly donates rare ferns to local botanic gardens, both for their collections and to sell for fundraising. Some of his more unusual plants are sold at rare plant auctions, raising even more money for local public gardens. 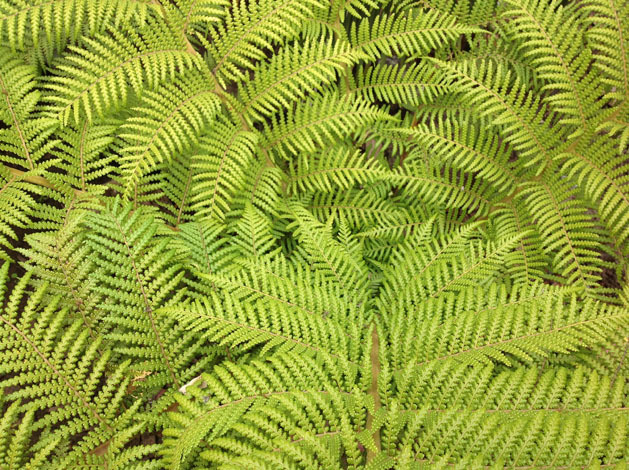 Looking at the thriving ferns in his collection, it is difficult to believe that some of them hail from as far away as New Caledonia and Lord Howe Island. In the coastal mists of Pacifica, they seem completely at home. Daniel runs a DNA sequencing laboratory in his garden shed! Using cast-off lab equipment from his former career in biotechnology, Daniel can sequence the DNA of a chloroplast (the photosynthesis engine in a plant) to identify unknown fern species. Since many of his plants come from spores that are collected in the wild, and there are at least 9000 species of ferns in the world, it is often difficult to identify a fern by appearance alone. He compares DNA he sequences to a library of ferns at the National Center for Biotechnology Information to identify the plant he is growing. This high-tech plant ID approach has enabled him to identify ferns from his collection as well as plants from other fern propagators.